Join the Goodnight Barn Committee and Stakeholders for a fun evening on May 11th at 5:30 pm at the Union Depot to celebrate our Restoration Kickoff. We will present a short Goodnight history and enjoy a few words from Dr. Robert Hamilton who owns Goodnight's Babcock Hole Ranch in Wetmore. 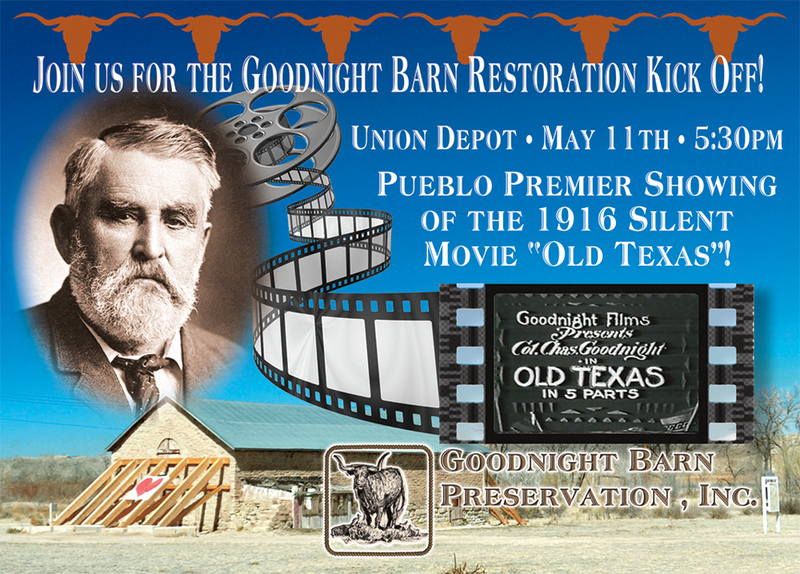 We will also be showing the Pueblo Premier of Charles Goodnight's 100 year old silent movie "Old Texas". We encourage y'all to wear your favorite Western clothes. Be sure to RSVP to 719-542-4458 so we have enough great appetizers for all!